An odd quirk of recent endurance history is that Johnny Mowlem has never raced in the Spa 24 Hours – until now. 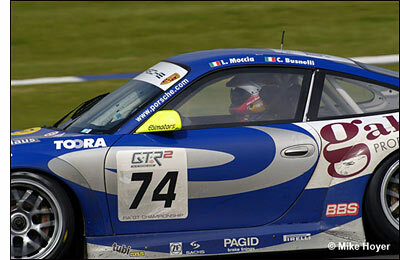 He’s confirmed in the #74 Ebimotors Porsche, with Emanuele Busnelli and Luigi Moccia, the sister car to the #75 Collard / Riccitelli / Dumas entry. That’s a reference to racing the Red Bull Porsche GT3 car, run by Ebimotors at Daytona last year. These 24 hour races are important to the top drivers – because they all want a chance to win them. Ebimotors is the factory-supported team in the 2006 FIA GT Championship – but the two GT3-RSRs will be up against a fleet of Ferrari F430s, plus the two Manthey-run Porsche 997s. Despite what happened at Le Mans, a Porsche might still be the weapon of choice for a 24 Hour race. Ebimotors is currently second in the FIA GT2 team points, ahead of both (Ferrari entrants) Scuderia Ecosse and JMB. Busnelli and Moccia are handily placed in the driver points with eight: the Spa race counts double, so with the leaders on 20 (Collard and Riccitelli in the other Ebimotors entry), big changes are possible. In other Mowlem news, he and his wife Fiona are off to Buckingham Palace on Friday of this week – to meet Prince Charles and Camilla, the Duchess of Cornwall. Don’t forget to bow if you see Johnny at Spa! 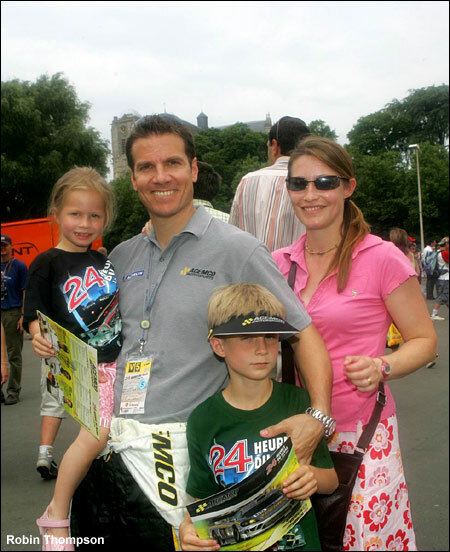 Here he is with his family at Le Mans.